Thanks for your letter, it was nice to hear from you. Sorry I didn't answer for a long time. I was very busy with my schoolwork. Обычно эта часть состоит из двух абзацев. Первый - содержит ответы на вопросы друга. Во втором абзаце, наступает ваша очередь задавать вопросы собеседнику, об этом сказано в задании. Обычно оговаривается, сколько именно вопросов должно быть задано. Начнем с того, что прежде чем выполнять какое либо задание из ЕГЭ нужно внимательно прочитать задание к нему. ...In Great Britain most young people want to become independent from their parents as soon as possible. Could you tell me what you and your friends think about not relying on your parents? Are you ready to leave your family immediately after you finish school? Is it easy to rent a house or an apartment for students in Russia? Дополнительная схема оценивания задания С1 "Личное письмо"
Ответ прост - используйте готовый шаблон! Его можно и нужно заучить наизусть. Шаблон обычно содержит в себе уже 60-70 слов, то есть останется только дописать его, исходя из задания и используя всего 40-50 слов. Не такая уж сложная задача, не так ли? Thanks for your letter, it was nice to hear from you. I'm sorry I couldn't reply straightaway. I was busy with my schoolwork. I'm sorry I couldn't reply straightaway. I was busy with my schoolwork. I'm only 16 and I can't help relying on my parents now, but most of my friends and I dream to be independent. As soon as I leave school, I'll go to university. If I find a part-time job, I'm ready to leave my family and start living on my own. 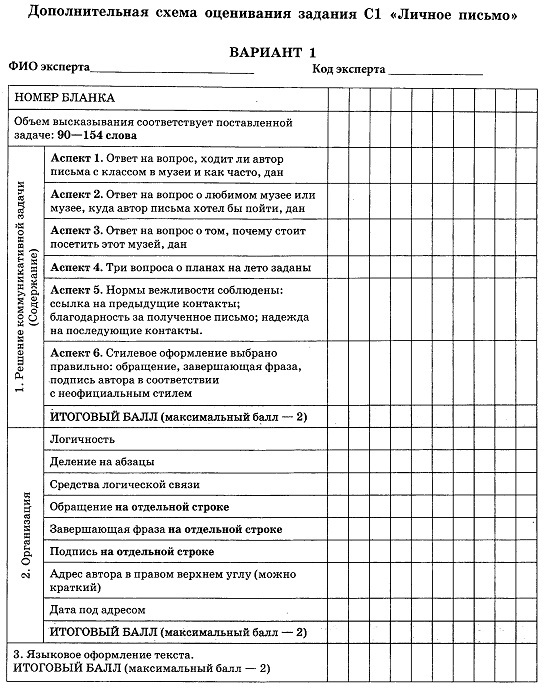 Of course, it's hard financially to rent a house or an apartment in Russia, especially if you are a student and don't have much money, but I'm prepared for this. Well, I'm happy to hear you've finally fulfilled your dream – a trip to Scotland! How long were you there? What places did you visit? Did you try on a kilt? Автор материала: Решетникова Анна Степановна. Источник публикации:www.nsportal.ru. • Сочинение “expressing opinion” пишется в формальном (деловом) стиле. • В данном типе сочинения требуется выразить свою точку зрения на заданную тему, а так же привести противоположные вашей точки зрения других людей и объяснить, почему вы с ними не согласны. Ваше мнение должно быть четко сформулировано и подкреплено примерами или доказательствами. 1 абзац. Привести 2-3 аргумента, подтверждающих вашу точку зрения, подкрепляя их примерами или доказательствами. Во втором абзаце вы должны придерживаться только ОДНОЙ точки зрения, например: Mobile phones in my opinion are very useful devices. ИЛИ I consider the mobile phone to be a harmful and useless invention. Ваши контраргументы мнению других людей не должны повторять 2ой абзац. Необходимо сделать вывод, обратившись к заданной в 1-м параграфе теме, что существуют 2 точки зрения на проблему, а также подтвердить собственную точку зрения. Useful vocabulary for composition"expressing opinion"
It is popularly believed that…. I would like to explain my point of view on this situation. I would like to express my opinion on this problem. Not only…., but…… as well. Задание выполнено полностью: содержание отражает все аспекты, указанные в задании; стилевое оформление речи выбрано правильно с учетом цели высказывания и адресата; соблюдены принятые в языке нормы вежливости. Примечание: минимальное количество слов – 180, максимальное 275. Если в сочинении 179 слов – «0» за содержание, если слов более 276, то проверяется только 250 слов от начала. Many cities in Europe do everything to promote bicycles as an ecologically clean type of transportation; however the governor of St. Petersburg signed a decree according to which bicycles will not be allowed in the city centre. Do you agree that bicycles should be banned in the centre of St. Petersburg? 2. Express your opinion and give reasons for it. 3. Give other people's arguments and explain why they are wrong. In European cities people ride bicycles a lot because they are aware that bikes help to save fuel and reduce pollution in cities. However, the governor of Saint-Petersburg decided to ban bicycles in the city centre and I fully agree with it. I would like to explain my point of view on it. In my opinion, the governor is absolutely right. In the first place, our roads are not adapted for biking as in Europe; they are too narrow and there are no separate lanes for bicycles. Moreover, bikes do not help the traffic situation but even sometimes make it worse as bicyclists often break traffic rules and cause accidents. In addition, the weather in St. Petersburg is not good for bicycle commuting. In winter roads are covered with ice, in autumn and in spring rains are frequent and roads are wet, so it is very difficult for cyclists to move. On the other hand, some say that bikes are undoubtedly useful for our health, I can not agree with it completely as there are a lot of road accidents where cyclists are injured. Some people may argue that bikes are ecologically clean, but you can also put special purifying facilities on cars which are faster and more comfortable as transport. To sum up, there are different points of view on this problem. I believe that bicycles should be banned in the city centre where streets are not specially created for them. As I see it, a bike is a kind of transport for short trips in the countryside.